Well you're referring to two things here, one which is abiogenisis - that is the initial arising of life from non biological matter. I don't think it takes much faith at all, to suppose that at least somewhere in an unimaginably vast universe, over the course of billons upon trillions of years such a random chance event could have happened not just once but plenty of times in the right conditions. Secondly you're referring to the diversity of life that arises from that point, or what we would call Macroevolution. It doesn't take a lot of faith to believe in that either - it takes a lot of evidence, and there is more than enough of it - the link I gave earlier gives an overview of some of it. Really? This didn't do anything for you? This thing is in an actual museum and is presented as a potential dinosauroid, had dinosaurs persevered. It's the most ridiculous thing I've ever seen in my life. Anyway, cheers. Say genki to the grappin for me when he comes to take your deluded souls away. They say that when he takes a soul, he's sorely pressed to keep it on with him, for all the ages. Or so the legend goes. 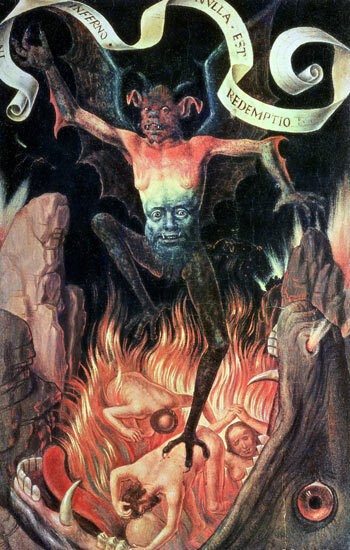 The Four Last Things: Death, Judgment, Hell, Heaven (1887): "Besides what has been already mentioned, the terrible appearance of the evil spirits makes death yet more alarming to us. It is the opinion of many of the Fathers, that every one, when expiring, sees the evil enemy, at any rate at the moment of drawing his last breath, if not before. How appalling this sight is, and with what terror it must inspire the dying, exceeds the power of words to declare. It is related of Brother Giles that one day, when he was praying in his cell, the devil appeared to him in so frightful a shape, that the Brother lost the power of speech, and thought his last hour had come. As his lips could not utter a sound, he raised his heart in humble supplication to God, and the apparition vanished. Afterwards, when relating what had befallen him to his brother-monks, he trembled from head to foot as he described the hideous aspect of the adversary of mankind. Then going to St. Francis, he asked him this question: "Father, have you ever seen anything in this world the sight of which was so horrible that it was enough to kill one to behold it?" And the Saint replied: "I have indeed seen such a thing; it is none other than the devil, whose aspect is so loathsome that no one could gaze upon it even for a short time and live, unless God specially enabled him to do so."" In parting I'd like to present you with a poem I wrote in honor of know-it-alls like you guys. Enjoy know-it-alls. Funny that you use the word know it all, when you're the only one presenting yourself as such. Ever heard of a term called projection? He fancies himself a poet. Or, rather, he simply fancies himself. Hi, I'm back. You do realize that Lovecraft was mad as a hatter, right? The man was head over heels in love with the devil. Draws vapors cursed with pestilence." I also looked up Shaggoth and can reconfirm that whoever came up with that was off his rocker. So far off his rocker in fact that he offed it out of existence. And I struggle and shriek ere the daybreak, being driven to madness with fright." "Slowly but inexorably crawling upon my consciousness and rising above every other impression, came a dizzying fear of the unknown; a fear all the greater because I could not analyse it, and seeming to concern a stealthily approaching menace; not death, but some nameless, unheard-of thing inexpressibly more ghastly and abhorrent." "But there appeared to them a sudden fire, very dreadful: and being struck with the fear of that face, which was not seen, they thought the things which they saw to be worse: And the delusions of their magic art were put down, and their boasting of wisdom was reproachfully rebuked. For they who promised to drive away fears and troubles from a sick soul, were sick themselves of a fear worthy to be laughed at. For though no terrible thing disturbed them: yet being scared with the passing by of beasts, and hissing of serpents, they died for fear: and denying that they saw the air, which could by no means be avoided. For whereas wickedness is fearful, it beareth witness of its condemnation: for a troubled conscience always forecasteth grievous things." It's amazing. I just found this video and when these people are describing Lovecraft's work they're simply talking about devils veiled under the costume of octopus aliens from mars. I am so sorry Bob. I've been riddled with guilt and I have to confess. I have been tapping your wife, day and night when you're not around. In fact, more than you. I'm not getting any at home, but that's no excuse. I can no longer live with the guilt and I hope you will accept my sincerest apology with my promise that it won't happen again. Touche. Perhaps a wee bit overzealous. Well I find the topic interesting nonetheless. Kishi, I reiterate that winning them over with clever speech is not going to work. Paul said so, and I agree with him. Also, if any of you were actually interested in my personal testimony, I would give it. The Lovecraft analogy was meant to point out that Shoggoths are the least of that person's problems, and getting eaten by them may be a preferable fate to the one he's blindly stumbling into. If the bible is the literal word of your God, I see no reason to believe any of it is true. Not only does there exist mountains of evidence against the validity of the events presented there, but we haven't a lick of evidence that such an entity isn't bold faced lying. It's possible you worship and empower a genocidal, soul-eating abomination from beyond the bounds of reality in exchange for a ticket to eternal pleasure, redeemable after death and able to be revoked any time by said entity. "But what about Satan?" You might be saying about this point. Well, returning to our above lovecraft analogy, while the existence of an antagonistic, malevolent, also soul-stealing (and possibly eating) entity is frightening, we have a much larger and more powerful abomination to worry about. Especially since we can't confirm that the devil isn't A) a feeding appendage of the main entity, sort of like the reverse of an angler fish's lure, or B) currently lodged somewhere in its exceedingly unpleasant digestive tract. Anyways I've never seen someone use Lovecraft's mythos in an argument about Christianity but I love it. I'm also not going to get into this argument when I'm hungover, but my troll-account senses are tingling. The member has 11 posts and most of them are arguing a nonsensical position in an off-topic section of a forum that doesn't get a lot of traffic in the first place. Unless someone from ttg know who it is? Edit2: Oh gods so many good ones to put here.... I'll just and one with each post! Kishi, I reiterate that winning them over with clever speech is not going to work. If you think his speech has been "clever", you have an odd definition of that word. I would argue as someone who was raised Christian, that the way to win people over is to behave, well, like a Christian. Something I have yet to see him do, with his holier-than-thou attitude. I suppose your criticisms about how I'm coming off are fair enough. I'll tone it down a notch. My apologies. I'm sure you can understand that it easy for one to lose his patience and become very defensive when engaged in these sorts of discussions because of posts with people comparing Jesus with the devil, and end up with a simple desire to ridicule and intellectually tear apart anyone who would do such a thing. Anyone can fall into the temptation to over zealously defend something they feel is being unfairly attacked. However, it doesn't help my cause any. Lovecraft professed himself a rationalist but here we are now with this strange legacy of the malicious powerful beings he wrote about that seek the destruction of mankind. There are now actual cults that worship these beings. It sounds strange, but over the years there have been a few small "cults" that have actually formed around the Cthulhu mythos. Some of these cults combined Lovecraft's mythology with other beliefs, like Satanism, while others seem to accept that Cthulhu and his brethren are fictional, but subscribe to the philosophy that those fictional beings represent. To me, this is the natural outcome of the enlightenment era rejection of God. With man now left to his his own weak reasoning powers corrupted pitifully by the overpowering passions that all men are subject to the devil found his way in easily enough. Lovecraft touted science and let Cthulhu in the door, but he's not the only one. Steven Spielberg is a similar story. He has always presented himself as a scientific rationalist character but you'll find that his work is filled with malicious powerful beings that seek the destruction of mankind. There are lots of examples but I'll stick to the alien area. In Close Encounters you have a seemingly peaceful group of aliens that come to enlighten the human race but in an interview with James Lipton Spielberg said that the scene at Devil's Tower was inspired by Fantasia's Night at Bald Mountain which is satanic in character. If you watch the two scenes together it will be hard to miss the similarities. In E.T. you have a seemingly peaceful alien who lives in a young boy's closet and with time comes to completely possess him. Note that E and T are respectively the first and last letter of the name Elliott. What's more interesting is that the film Poltergeist which was released within days of E.T. and to this day many believe is to have been ghost directed by Spielberg himself is about an evil ghost that lives in a little boys closet who with time comes to possess the little girl who lives in the same room. The two films are mirror images of each other in a lot of respects. The seemingly peaceful alien image ends though with Speilberg's War of the Worlds which has the aliens coming up from hell and feeding on the blood of the hapless as civilization is completely eradicated. Honorable mention goes to sharks and dinosaurs, with one of the latter, eating a man of a toilet who was in the midst of imploring the mercy of the Blessed Virgin Mary. A married couple with two young children move into a Pennsylvania farmhouse that turns out to be inhabited by demons. Darren McGavin portrays the TV producer husband, while Sandy Dennis plays his actress wife. Popular child star Johnny Whitaker co-stars as their oldest child, who becomes possessed and begins to torment his family and their friends. When the mother begins to sense that something may be wrong with her son, her husband and friends think she is going insane. Now get this. About half way through the film the wife character sits reading a book of incantations aloud. As she lists off a bunch How-to spells she comes upon this chestnut: "How the devil takes over innocent people and uses them to do his work." The man in the video I posted earlier--Neil Gaiman I want to say--relates a story about being at a Lovecraft panel where a man honestly asked, "What does the panel think about what I believe to have happened which is the elder gods were using H.P. Lovecraft to convey their story to mankind and to build up belief levels to the point at which they could manifest." Exactly, but the truth is that devils used the unstable Lovecraft to convey their story under figures and symbols in order to take up habitation in the minds of many who otherwise wouldn't have let them in. The same goes with Spielberg, who has said of his home in Haddon Township, New Jersey, which contained a crack, ""I remember lying there, trying to go to sleep, and I used to always imagine little Hieronymus Bosch-like creatures inside, peeking out and whispering to me to come into the playground of the crack and be drawn into the unknown there." Who has done more to popularize a belief in aliens than Spielberg? St. Cyril also, writing to St. Augustine, says that one of the three men who were raised from the dead told him: "As the hour of my departure drew nigh, a multitude of devils, countless in number, came and stood about me. Their forms were more horrible than anything imagination can conceive. One would rather be burnt in the fire than be compelled to look upon them. These demons ranged themselves around me, and reproached me with all the misdeeds I had ever done, thinking to drive me to despair. And in fact I should have given way before them, had not God in His mercy come to my succour. King Solomon: "The way of the wicked is darksome: They know not where they fall." There are other examples but I'm way too tired and I thought I should at least put something serious about what I believe here in short to apologize for my sarcasm in previous posts. Basically, I don't caaaaare if someone thinks the Cthulhu mythos is real or not, as long as they're not going around engaging in human sacrifice and the like. And incidentally the only thing that makes those stories superficially less plausible than the Bible ones is that we have more up to date record of the authorship of Lovecraft. Certainly there's nothing about the actual content of the bible that rings very plausible. And certainly I don't think it says anything about Lovecraft himself who doesn't seem all that different from any other writer with a weird story to tell as far as I can see. Similarly I don't caaaaare if someone believes in some or all of the bible, as long as they don't suppose it gives them reason to curtail my own rights. Except, I do care - a little. I believe that generally an evidence based understanding of the world helps us make good decisions about how to treat it and one another, rather than an ideology based view of the world. So it's my wish that more people understood what evidence really is and how it is used to build a picture of the world and where it can go wrong. You could say that's an ideology in itself and I suppose it is, but it's a mild one, one that makes few presumptions, compared to a religious ideology, and I think one that is less prone to the sort of wooly thinking that the concept of faith encourages. Feddle what's the name of that comic? 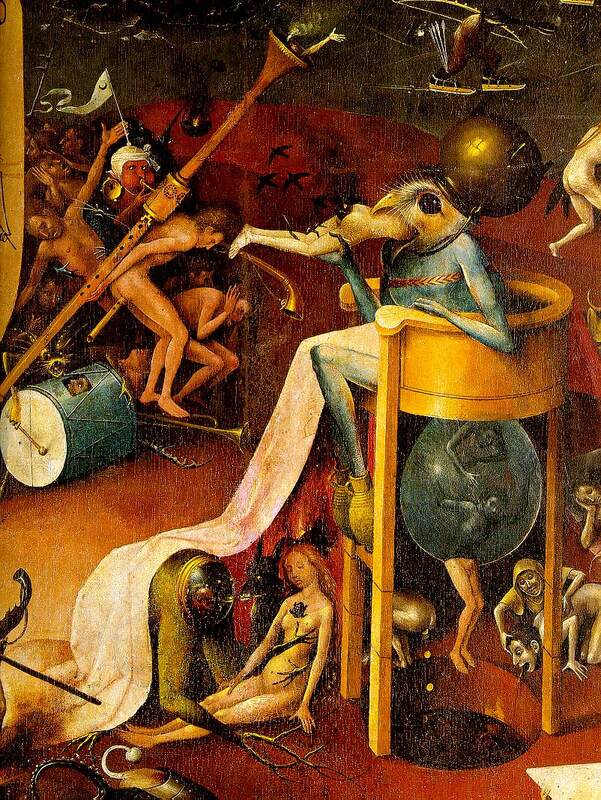 Also that demon eating people is pretty cool, I would definitely put a print of that on my wall. I'm not entirely sure what I'm looking at but it's aesthetically pleasing. I think my favorite part of religious folk is their innate ability to cherry-pick verses they like while ignoring ones they don't. Well, to be fare, some people can't tell parody and pseudoscince from the real thing. Actually, a lot of people can't. I mean, evopsych is a shitstain on the rest of biology, having become a refuge for jerkasses desperate to prove that their own biases are reflective of reality rather than engage in self examination. 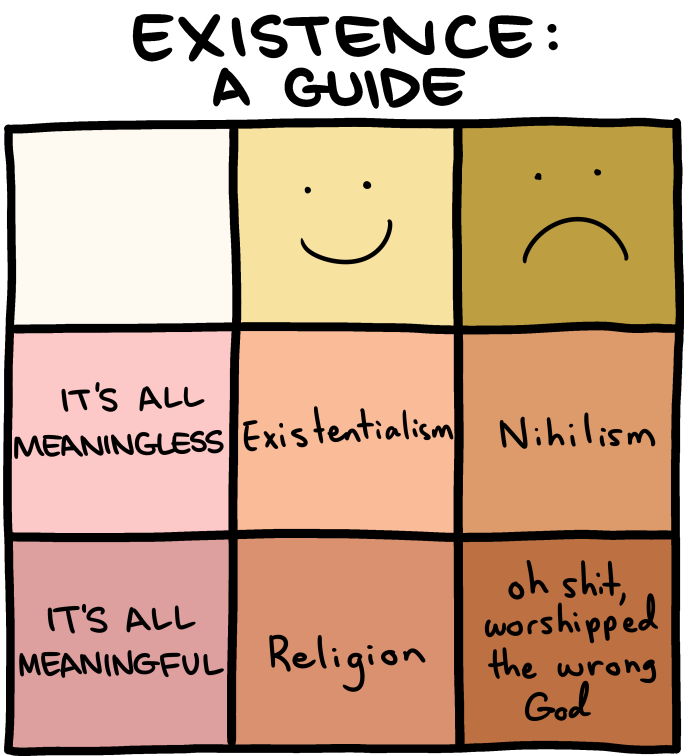 It's Saturday Morning Breakfast Cereal! ...But a lot of them do. Note that the big red button at the bottom of the comic gives you an extra panel. Usually. Like super alt text.